The Exire Pro RC Cycling Shoe from VauDe is trimmed for maximum power transfer. The top of the three closure straps has a side adjustment and ratchet closure mechanism so it can be optimally adapted to the shape of the foot, ensuring a perfect fit. The heel cup is made from special gripper material guaranteeing outstanding hold, and the stiff Race NT sole allows you to transfer power to the pedals efficiently. Further features: the smooth material is impervious to dirt, a TPU toe cap serves to absorb shocks, and ventilation slits in the front help air circulate for improved foot climate. 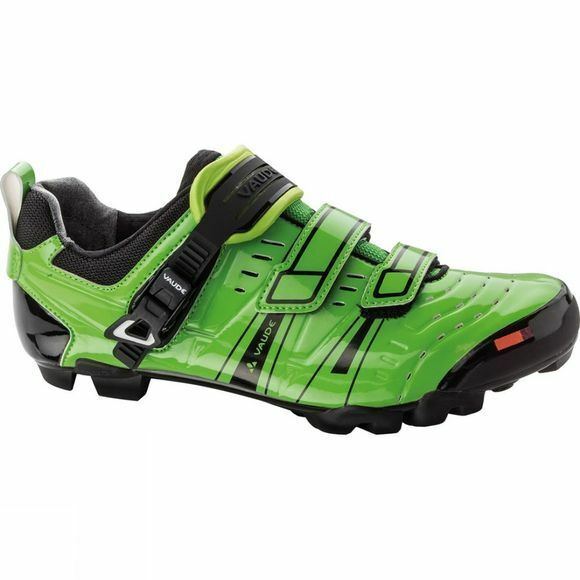 The race shoe is compatible with all current MTB clipless pedal systems.